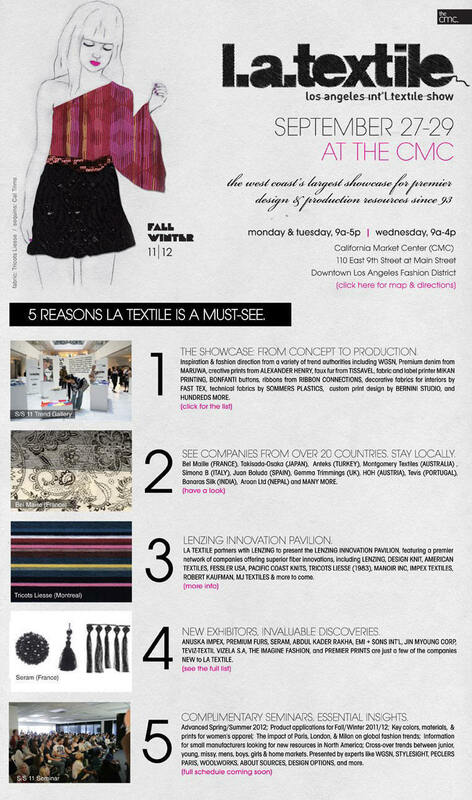 THE LOS ANGELES INTERNATIONAL TEXTILE SHOW (L.A. TEXTILE) is the essential West Coast destination for cutting-edge fashion direction, premier textiles, and creative design resources from around the globe. Hosted by the California Market Center (The CMC) since 1993. From hundreds of high-quality, creative fabric collections, to industry networking mixers, to swatch reports and fashion culture insights from renowned trend agencies, the LA Textile is a forum for cutting-edge fashion direction as much as it is an essential resource for premium fabrics and design resources. Learn more about CMC and the textile industry.